BE SURE TO USE VERSION 4.65 OR BELOW. Newer versions do not format the .nob properly and will not work. 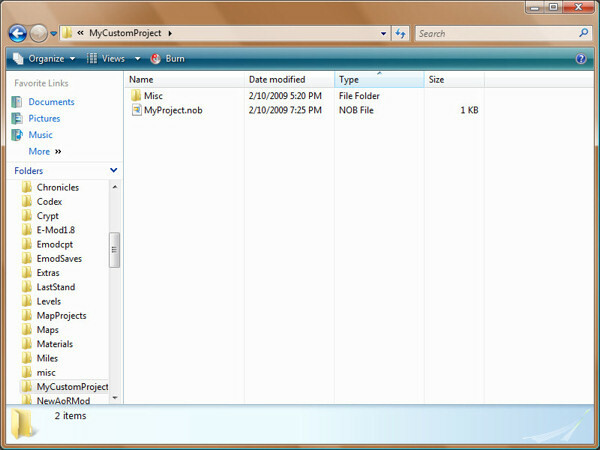 -Right-click the misc folder and a pop-up menu will appear. 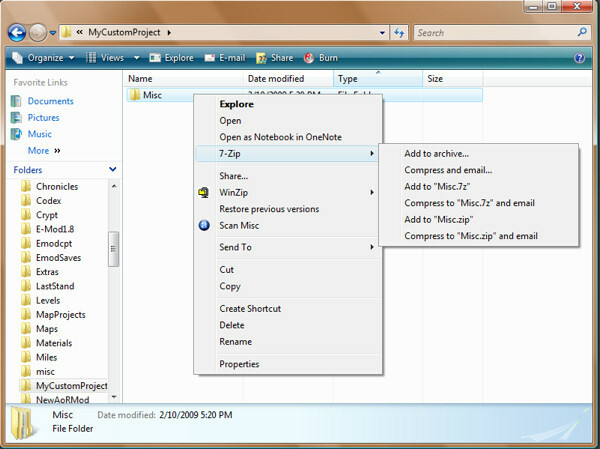 -If you installed 7-Zip then 7-Zip should be on the list, within 7-Zip choose the Add to archive option. -From the Compression level choose Store. You can now distribute this .nob publicly, just be sure to put it into a .zip file with a readme containing instructions on how to install along with what the end-user is installing. Pretty much all you have to do is place the .nob file into your main Vampire the Masquerade - Redemption directory and your sword will be added on the list... or whatever else you created, but here is a bit of info to remember about nobs. *You can only place the sounds folder in a nob file if it contains actors, environment, objects, gameplay, and voice sub-directories. Music, StereoAmbient, and Dialog are not usually read in .nob files. Sub-directories included in the above folders must have proper names to read the files within them. For more information on file types and where they must go. Additional Note: you cannot place a Codex directory into a nob file, but you can place individual .class files into a Codex.nob file, but you must make sure that the Codex.nob file is inside a mod folder and not placed inside the main VTMR directory where it could overwrite the original Codex.nob. Codex.nob files located in mod directories are usually the brains behind the mod's functionality. Without it, the mods usually don't function. After 3 hours trying to figure out why my .nob files weren't working, I determined winrar is a better option. I think 7-zip changed some of their encryption methods, but as long as zipcrypto is still available in the newer versions, it should still work. So be sure to check encryption method as that might have changed in the newer versions. So yeah, siggy, they must have completely rewrote the encryption to break nob file creation. Not sure why. Stick with 4.65. No real reason to use any newer anyway. I still highly recommend 7-zip because winrar is not free. I like WinRar quite a lot... besides everybody knows how to get stuff from free, this is the internet! it was meant to be NEUTRAL and for SHARING.